Spring has sprung! Time to get out the tents, sleeping bags, stoves, lanterns and sleeping pads and check them after their seasons in storage. 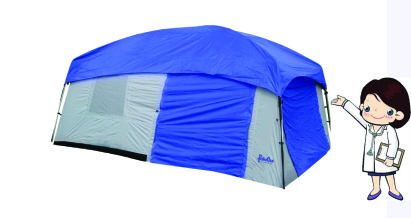 Set up your tent and inspect for tears, mildew and zipper pull function. If tent is torn, you can try stitching the tear yourself with nylon thread. If it has a small hole, you can use “K-Tape”, readily available at the local REI store or on Amazon. REI also has a repair service for rips and tears, but the turnaround time can be as long as 6 weeks. Give yourself plenty of time for the repair to be finished in time for your trip. If tent has mildew or mold, take a cup of Borax and add to a 5 gallon bucket of water. 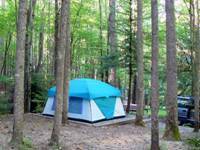 Set up the tent and wipe it completely down with a washcloth soaked in the Borax/water solution and rinse thoroughly. Allow to dry standing up. Vinegar works better, but can leave a residual smell, so use what you prefer. Check all zippers to see that they function properly. Zipper tape can be lubed with dry graphite or Tri-Flo lube, found in bicycle shops. Lube inside each zipper pull for easy sliding. Take out of storage bag and lay flat overnight. Check for tears and smells. If you notice holes or tears, you can use K-Tape to stick over either one. If sleeping bag smells, wash in a front loader or top loader with no agitator, using a mild detergent on LOW cycle. Tumble dry on LOW in dryer. For synthetic bags, one cycle should be sufficient. For down bags, you’ll want to place 3 sets of balled up socks inside the dryer with the bag, and fluff the bag after each cycle has finished. Place back inside the dryer for further cycles until down has lofted, and bag is completely dry. Check O-rings on gas valves, and lube with suitable grease, such as silicone. Attach a fuel bottle and test the flame starter. If there is a clog in the line, you may need to replace the tube or valve. Replace mantles on lanterns and burn them according to directions, so the lantern is ready for use upon arrival at your campsite. Check for leaks/holes and patch any with appropriate patches and Seam-Seal. Allow patches to cure and dry for 24 hrs before rolling up and storing in sack. If there is evidence of mildew, follow directions with Borax as per tent cleaning. Starting your trip with repaired/checked gear will ensure a positive, memorable experience! 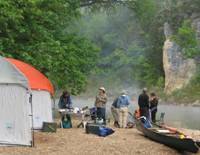 There’s nothing worse than getting to your campsite with gear that doesn’t function. And there’s nothing better than being outdoors in a clean, dry tent and getting a good night’s sleep in a clean sleeping bag. This is an open-face taco, but you can fold it if you like. These are my version of tacos, that is to say these are unlike any other taco, but still quite simple to make. As with any dish, and especially tacos, there are countless variations and I always encourage experimentation in the kitchen (or campsite). The dollop of salsa or chili sauce on top is for the namesake. Red chili sauce (you can buy this if you like, but just puree fresh tomatoes, 3 to 4, with a heaping Tbsp. of chili powder and a little minced garlic. Add hot sauce if you like. These can be done 1 or 2 at a time on the stove top or in the oven or grill in quantity. As always, I suggest prepping as much of the produce at home as possible and transporting to the camp site in plastic bags or bowls. Grill and thinly slice your chicken or fish and set aside. Coat 1 side of your tortillas with olive oil and place oil-side down on the heat. Use medium heat, you don’t want them to cook too fast because you need time to add the toppings. While on the heat, sprinkle on a liberal amount of cheese first thing. Then add your chicken/fish, red onion, red cabbage, and cilantro. Top with a sprinkling of the cheese. Let them grill or roast for about 3 to 4 minutes. It won’t take long, but it’ll depend on how hot your grill is. If you’re doing this in the oven, 350 degrees for about 5 minutes. 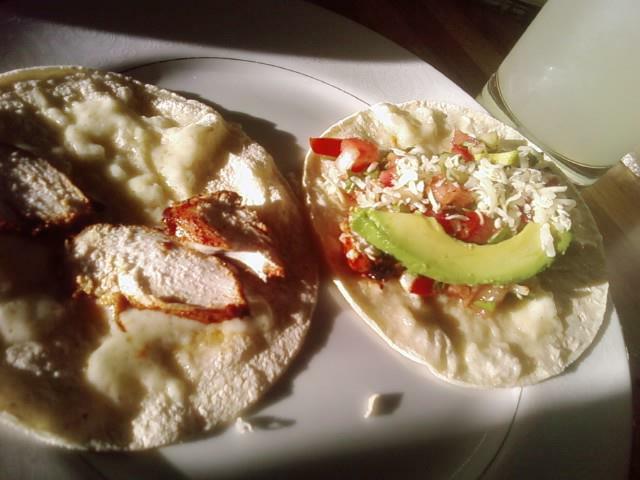 Just make sure that the bottom of the tortillas is only slightly browned or just barely beginning to show grill marks. As soon as they do take them off. Add, in this order, avocado, Pico de Gallo, sour cream, and top with chili sauce. Garnish with lime wedges. Serve with limeade – 2 cups fresh squeezed lime juice, 1 and ¼ cups sugar, and half a gallon of water. Tonight, or any night after sunset in this month of April 2015, people around the world will see the dazzling planet Venus in the western sky. Then … wait a bit for the sky to get fully dark. After twilight ends, the elusive zodiacal light might appear in your western sky with Venus – if your sky is dark enough. For those living in the Northern Hemisphere, Venus can be your guide to the evening zodiacal light this month. This is a good time of year to see the zodiacal light in the evening from mid-northern latitudes. As twilight ends, if you’re in the Northern Hemisphere, look for Venus in the midst of the mysterious zodiacal light – a cone of light jutting upward from the western horizon about 80 to 120 minutes after sunset. April 13 – 18 – International Dark Sky Week. International Dark Sky Week is held during the week of the new moon in April. It is a week during which people worldwide turn out their outdoor lights in order to observe the wonders of the night sky without light pollution. It has been endorsed by the International Dark-Sky Association, the American Astronomical Society, the Astronomical League. So go ahead and turn out your outdoor lights this week to appreciate the beauty of the night sky! April 18 – New Moon. The Moon will be located on the same side of the Earth as the Sun and will not be visible in the night sky. This phase occurs at 18:56 UTC. This is the best time of the month to observe faint object such as galaxies and star clusters because there is no moonlight to interfere. April 22, 23 – Lyrids Meteor Shower. The Lyrids is an average shower, usually producing about 20 meteors per hour at its peak. It is produced by dust particles left behind by comet C/1861 G1 Thatcher, which was discovered in 1861. The shower runs annually from April 16-25. It peaks this year on the night of the 22nd and morning of the 23rd. These meteors can sometimes produce bright dust trails that last for several seconds. The first quarter moon will set shortly after midnight, leaving fairly dark skies for the what could be a good show. Best viewing will be from a dark location after midnight. Meteors will radiate from the constellation Lyra, but can appear anywhere in the sky. April 25 – International Astronomy Day. Astronomy Day is an annual event intended to provide a means of interaction between the general public and various astronomy enthusiasts, groups and professionals. The theme of Astronomy Day is “Bringing Astronomy to the People,” and on this day astronomy and stargazing clubs and other organizations around the world will plan special events. You can find out about special local events by contacting your local astronomy club or planetarium. You can also find more about Astronomy Day by checking the Web site for the Astronomical League.